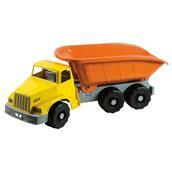 Well prepared for the sandbox: Here comes the giant truck with 6 wheels in a colourful red-blue-yellow design. You lack a good truck to transport the sand away? The 75cm Gigante truck can carry a load of upto 100kg!